How Do Double-hung and Casement Windows Open and Are They Easy to Use? Looking to purchase a replacement window for your home? There several different types of replacement windows, and the vast amount of options can be confusing. What style of window do I currently have? What type of window do I want to replace my window with? The choices can make you dizzy! In this post, we will explain the differences between a double-hung window and a casement window and share some helpful tips to make your decision a little easier. Stanek double-hung windows are easy to open due to their spring-loaded balance system that aids in lifting the window. This window style also has an operable upper and lower sash. Do you hate the hassle of cleaning your windows? Double-hung windows easily tilt-in to ensure effortless cleaning of both sashes, inside and out. 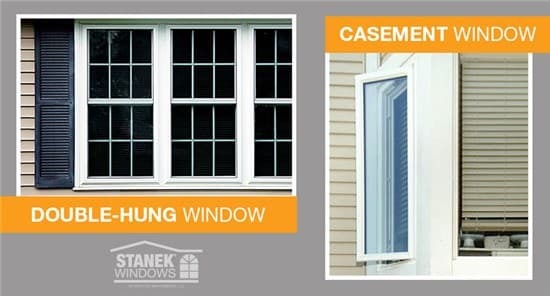 Stanek casement windows have a fold-down handle that easily opens and closes the window, making them easy to use. To open a casement window, you must open the lever lock and rotate the easy-turn handle. All casement windows open to a 90-degree angle, which allows the inside and the outside of the window to be cleaned safely from the interior of your home. 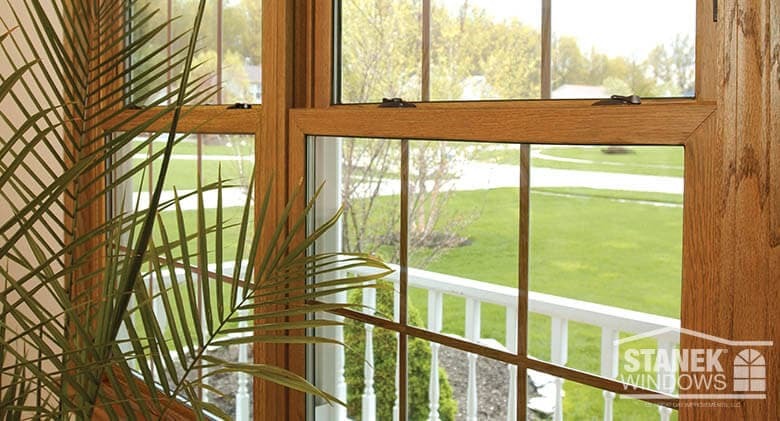 When comparing both window styles, a significant difference between the two is that double-hung windows have screens on the outside of the window, while casement windows have the screen on the inside. 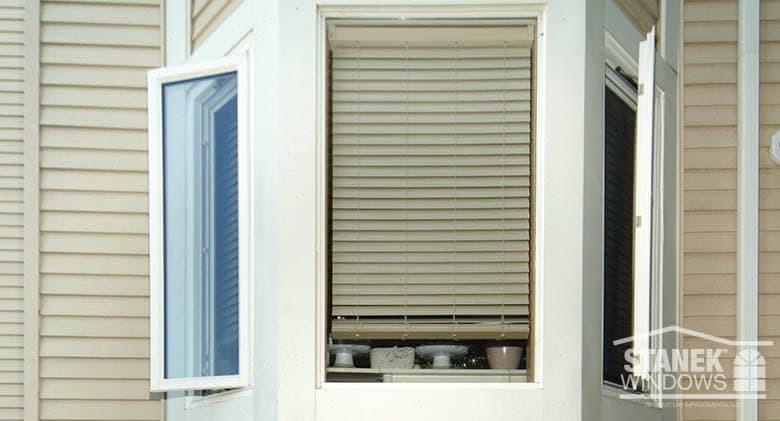 However, Stanek casement window screens are color matched with the interior of the window – including woodgrain options, so the screens look as though they are part of the window. 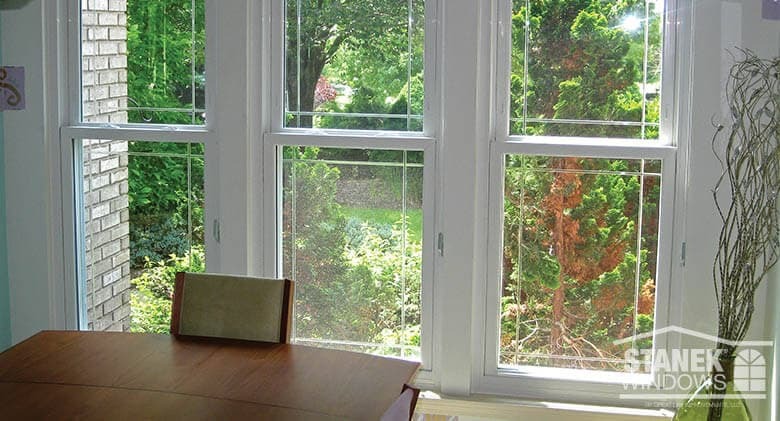 What’s the View, Best Location, and Cost for Double-hung and Casement Windows? 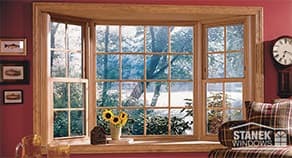 Outdoor View: An essential element of your choice in replacement window style is the outdoor view. Double-hung windows have a meeting rail (the horizontal bar) in the center of the window that can potentially be at eye level. This could prohibit your view of the outdoors depending on the location of the window. If you’re looking for an unobstructed view, casement windows may be the right decision for you. Casement windows do not have bars in the middle of the window, providing a clear view of the outdoors. Screens can often blur or obstruct your view. 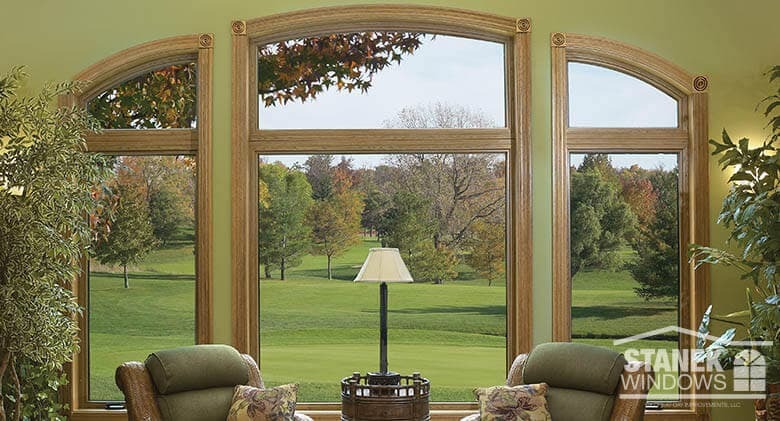 Whether you choose a double-hung or casement window, both offer you a beautiful view of nature that is so clear you feel as though you are a part of it. The revolutionary FlexScreen now comes standard on all Stanek double-hung windows, while Stanek casement windows utilize a standard fiberglass screen that is color matched to the window for a seamless look. Replacement Window Cost: The price of replacement windows can vary, but on average, double-hung and casement replacement windows are similar in cost. Other factors that impact the cost of a window include materials, glass type and options chosen. Quality windows that are built to last will cost more than cheap alternatives, but are worth the investment. Best Location for your Replacement Windows: Something to think about before you decide on which type of window is right for you is the location you will be placing it in. Larger windows can sometimes allow too much heat into your home during the summer months. To help reduce solar heat gain, select low-e glass. For windows that get direct sunlight all day, think about choosing triple-pane glass. It’s also important to consider what type of room your windows will be in. Double-hung windows placed over your kitchen sink would be tough to open and close, which makes casement windows an ideal choice for your kitchen. Casement windows are also ideal for openings where you’d like to have an unobstructed view of the outdoors, while double-hung windows are great for bedrooms because of their ability to have both the lower and upper sash opened, which allows maximum ventilation. It is also important to consider the proximity to exterior pathways or seating areas. Since casement windows open outward, they can be an obstruction or hazard, making double-hung windows an ideal option near walkways, decks and patios. Energy Efficiency: The top and bottom sashes of double-hung windows fit very snugly in the window frame, which limits air infiltration. This, coupled with multiple bulb seals makes Stanek double-hung windows exceptionally energy efficient. Casement windows, on the other hand, tend to have a slightly tighter seal than double-hung windows when they are locked, since there isn’t a track for casement windows to slide on. The tighter the seal of the window, the more energy efficient it is. Ventilation: Double-hung windows have the advantage of a top sash that can slide up and down, as well as a bottom sash that allows a nice breeze inside. However, when a casement window is open, the window surface area acts as a sail by catching the wind and sending it into your home. Both options provide excellent ventilation. Glass Options: Both window styles can be manufactured with double-pane or triple-pane glass. Each glass type is built with Super Spacer® technology between the glass panes that helps to prevent seal failure and prohibits the transfer of heat. 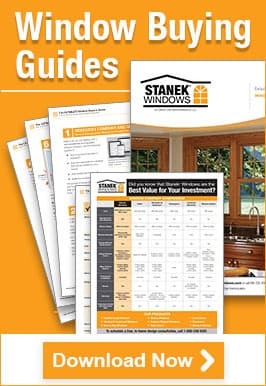 Whether you decide a casement window or double-hung window is best for your home, Stanek can provide you with custom-built, exceptional quality replacement windows that are affordable and easy to maintain. If you’re ready to begin your replacement window project, give us a call or schedule your free, in-home estimate online today.